Fundraisers are events, where businesses and individuals strive to put their best social persona. Today, corporations and individuals are getting conscious about the idea of giving back to the society. No wonder, there are more social awareness programs than before. Businesses and individuals can invest in 5×7 fundraiser magnets for building awareness about the cause. Fundraiser magnets are usually sought by school PTA organizations and small businesses for fundraiser events. People would love to retain such soul stirring personalized magnets over their refrigerator doors or other visible surfaces within the home. Customized 5×7 calendar magnets are sure to become great goodwill ambassadors due to their large size. Calendar magnets are very popular promotional gifts and individual gifts. Marketers are seeking these customized magnets for relationship building because it offers them large space to express their interests, contact details, and dates. Personalized 5×7 picture frame magnets are becoming popular choice for announcing birth of the baby, save the date announcements, graduation announcements and more. People love to retain such emotionally bonding personalized magnets over their refrigerator door always. Definitely a big, big, and big way to announce the impending nuptials in style. Customized wedding magnets 5×7 are perfect for setting the mood and tone for the impending nuptials. Sending away save the date cards are age-old idea of keeping people informed about the special day in the life. These cards politely invited and encouraged people to attend the event. Many couples love to match their wedding cards with their wedding trousseau. Today, with the advent of magnet advertising, they are gyrating towards large sized 5×7 magnets for making their wedding announcements in style. Free full color printing offered by many online magnet stores allows them to go creative with their announcements. People would be happier to retain happy looking and chirpy personalized magnets over their refrigerator doors as long as they can. It is definite that full color wedding magnets would hog limelight as a wedding memoir, when the event passes. Large promotional sales flyers aren’t new and no one would be surprised on receiving the one. However, magnetic sales flyer is definitely going to be a sharp hitter due to its persuasiveness. Unlike the paper sales flyers, people would retain these customized magnets as refrigerator art as long as they can. As said before 5×7 is definitely a bigger size of personalized magnet. They set perfect ground for painting emotions and expressions in various colors. You can make the best use of the space for your personal and professional advantage. 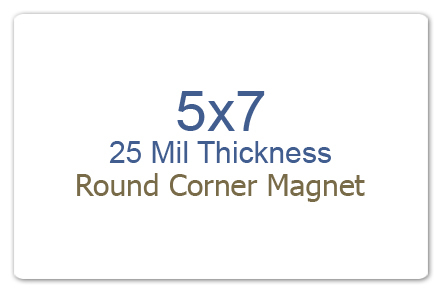 Save on online design proof, art setup, shipping, and full color printing by ordering your customized magnets from any reputed online store stocking only Made in USA magnets.